TeamRock Radio is to broadcast 52 rock shows hosted by Bruce Dickinson which originally aired on BBC Radio 6 Music. The first six episodes will be available on demand from this Saturday (December 6). 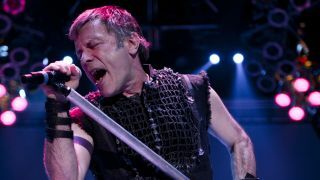 TeamRock has reached an agreement with the BBC to re-broadcast the shows, hosted by the Iron Maiden frontman for eight years up until 2010. It featured interviews with iconic rock artists as well as some of the best classic rock music. TeamRock.com also owns a portfolio of rock magazines, including Classic Rock, Metal Hammer, Blues, Prog and AOR and has just launched a new membership model, TeamRock+. You can tune into TeamRock Radio via DAB, online at teamrock.com and on the TuneIn app.